The Poem Farm: Happy Birthday to The Poem Farm...and National Poetry Month! Happy Birthday to The Poem Farm...and National Poetry Month! Today, March 29, 2017, is the seventh birthday of The Poem Farm! 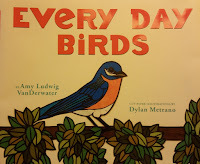 To celebrate this happy occasion and all of the wonderful friends I have made here, I will give away 10 copies of my EVERY DAY BIRDS to a class or group in special need of books. If you have a suggestion as to where to send these books, please leave it in the comments, and I will announce the winner (one winner for all 10 books) on Friday, April 12. We are almost to the eve of the beginning of National Poetry Month. Started by the Academy of American Poets in 1996, this month-long celebration is always full of delights and surprises. 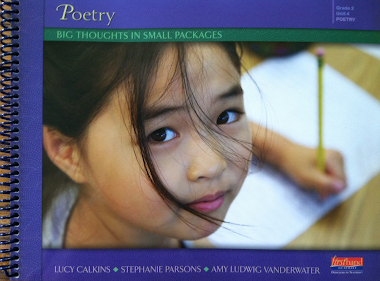 You can learn more about ways to celebrate National Poetry Month at poets.org. This logo below comes from the poets.org site, a treasure trove of poetry goodness. Each year at The Poem Farm, just like many other writers, I choose to write and share a poem each day. It has been fun to organize these poems around themes, and during the weeks before April, I find myself trying to choose something that piques my interest. Before we talk about this year's Poetry Month project at The Poem Farm, here's a timeline of my past Poetry Month projects here. 2010 - The Poem Farm Begins! I wrote a poem each day for a month, beginning actually, on March 29, 2010. 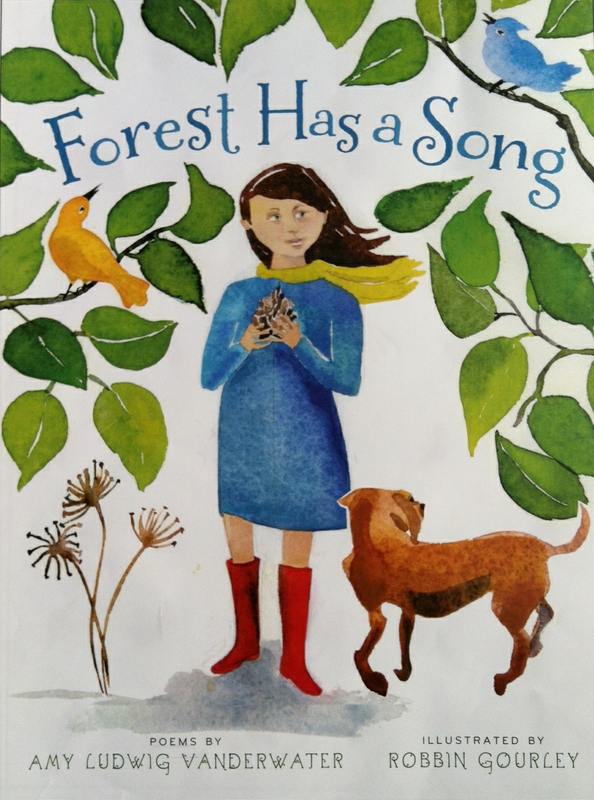 This blog just to be a one month project, just for me, to get me writing again as I awaited the publication of FOREST HAS A SONG. At the end of April 2010, I was having too much fun to stop, decided to go for one whole year, publishing a poem at The Poem Farm each day. After that, I still hung around! 2011 - For each day of April 2011, I continued to write and share daily poems. However, I had no theme as the blog was just entering its second year. 2012 - A-Z Dictionary Hike - Here's where the themes began. Each day of April 2012, I opened my children's dictionary to a different letter, starting with A, ending with Z. Eyes closed, I pointed to a word and this word became the title of that day's poem. 2013 - Drawing into Poems - For each day of April 2013, I slowed myself down and looked closely at an object, drawing it with black pen into my notebook. On some days, I wrote poems from these drawings, but on many days, I simply allowed the looking-drawing practice to practice becoming a closer observer. 2014 - Thrift Store - For each day of April 2014, I wrote a poem from a photograph of an item I found in a thrift store. These poems are no longer at The Poem Farm as I am trying to sell them as a collection. 2015 - Sing That Poem - For each day of April 2015, I wrote a poem to the meter of a well-known tune and challenged readers to match the poem to the tune by seeing if it was singable to the same meter. 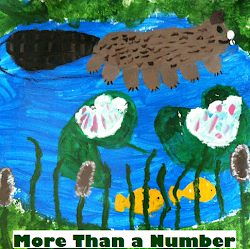 2016 - Wallow in Wonder - For my 2016 National Poetry Month project, I celebrated learning and writing from learning, writing poems from each daily Wonder at Wonderopolis. I have not yet collected these posts into one post, but I will do so. Students - Each day of April 2017, I will close my eyes, and I will reach into my box of 64 Crayola crayons. Each day I will choose a crayon (without looking), pulling this crayon out of the box. This daily selected crayon will in some way inspire the poem for the next day. So, on March 31st, I will select the crayon for April 1st, on April 1st I will select the crayon for April 2nd's poem, and on through the month, thinking and writing about one color each day for a total of 30 poems inspired by colors. Writing from colors is popular with poets. My friend Laura Shovan did this in at her blog in February 2014, inviting poets to write from Pantone colors each day. And folks will often write poems inspired by paint chip colors, as you can see here at Mrs. Hall's blog, Fabulous in Fifth. I welcome any classrooms of poets who wish to share class poems (class poems only please) related to each day's color. You'll see instructions on how to do this beginning on April 1. Happy almost National Poetry Month! Write a rainbow! Happy blog birthday, Amy! Your poem farm has really thrived over the years -- such a robust crop of poems and friends! Your plan for National Poetry Month sounds delightfully vibrant. I talked to my students yesterday about what project they would like to do for April. E said she wanted to study her favorite poet...you! We decided to write daily poems to ABCs of forms. I'll introduce a form each day. I think C will be crayon poems! Happy, Happy Blogiversary, Amy! What a fabulous idea to write from the crayon box. Sounds like a book title to me. I've loved all the themes through the years that you've chosen, but my favorite is still the thrift store year. It was wonderful fun to see what you found. As for the giveaway, I know that Carol Wilcox's school would love the books so I submit that school as an entry. Have a "colorful" day! Amy, I love this idea! What could be better than crayons and poems - two of my favorite things! I'll be pulling out the crayon box as I read your poems - that way I can smell them too! Happy birthday to the Poem Farm, and I'm so looking forward to your project this year! 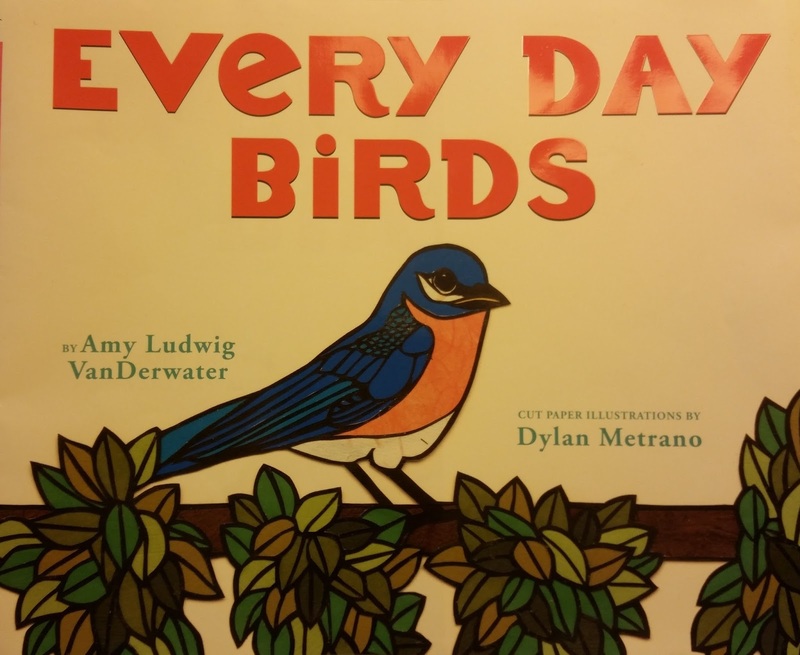 HI Amy, I love the idea of writing about color. One of my favorite books is HAILSTONES AND HALIBUT BONES by Mary O'Neil. My students loved those poems too and wrote some wonderfully creative poems. I look forward to following your color poems this month! Happy birthday to The Poem Farm! No party would be complete without crayons. :) Many moons ago, I was going to take a similar approach to writing a children's album. Unfortunately I only got one song written, but I'm sure you'll do much better! We are excited to join you for National Poetry Month. Congratulations on The Poem Farm's 7th birthday! There is a school in town that we would like to recommend to receive the ten donated books. The name of the school is Hanley Elementary, and we have been working on some projects with them this year. We look forward to reading more of your poems. Happy 7th Birthday Poem Farm! The Poetry Month activity sounds like fun!! Happy Poem Farm Birthday. I pick blue from the crayon color box for blue skies over the Poem Farm always and for a banner of great big blue letters spelling out Happy Birthday, Amy! Somewhere over the rainbow, Amy's ideas shine...and inspire, and sparkle, and spread joy! I love this year's project, Amy! I love this, Amy - not just the emotion and joy of it, but the structure itself. Very effective! And Happy Blog Birthday! Amy, your imagination has led you down many paths over the years. Happy Blogiversary! Your Writing the Rainbow theme for National Poetry Month is splendid. I look forward to your first poem and many thereafter. Thanks for hosting Poetry Friday. I am setting the clock for a countdown to my Winter Wonder Gallery. I love this colourful idea! I can see this being such a fun project to do with students! a poem, a farm, a month's begun. words and stanzas, the muse's call. Thanks for always inspiring, Amy. PS I can't wait to read your crayon-inspired poetry!!! I am subbing in gr3 today and gr5 tomorrow.....will share this and Friday's posts. Can't wait to share with kids! This is an interesting project! I am looking forward to reading your poems. I'm thinking I might just go get myself a box of Crayolas and start writing some poetry! A colorful poem Amy, in more ways than one. 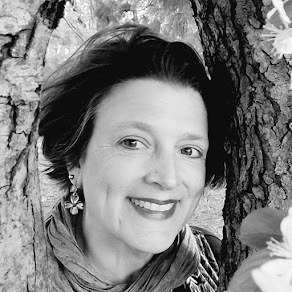 Happy Birthday and thanks for hosting Poetry Friday! Happy blog birthday. 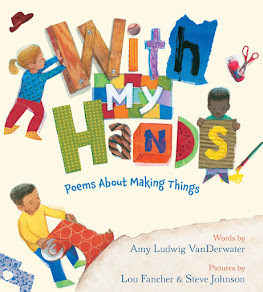 I know some young poets who would be thrilled to get copies of this book. We, Mrs. Staub's class at Arcade Elementary, are thrilled to be following along as you embark on yet another fascinating poetry challenge. While we have completed repeated readings of a poem each week since the start of school, this month we are allowing ourselves to fully dive into and get lost in the world of poetry. With the help of your blog page and a variety of poetry books loaned to us from our fabulous librarian, Mrs. Pierce, we continue to foster a love for the art of poetry. Our 4th grade poets would eagerly, and very willingly, provide a home to your new publication, if we were so lucky to be chosen. Nonetheless, we look forward to starting our day with you each and every morning this month! We are so excited to participate in this poetry project! We are using many different boxes of crayons for inspiration! Thank you for the great ideas. Be looking for us on Padlet soon! The students of Hillcrest in Downers Grove, IL are reading along with your wonderful poems this month! We will also be writing some color-ific poems of our own. I really love your website layout, especially the colors and soundcloud links. It makes it so easy to share your poetry with students in a classroom setting. We have talked about how hearing a poet read their own words is special. Thank you, as always, for your thoughtful, warm inspirations. We are going to participate in Writing the Rainbow thanks to Mrs. Williams- the big "A"pple! We have chosen our first color for our class poem - RED ORANGE! Thank you for the great ideas! We will be posting on Padlet soon.